This original design features a basket of strawberries surrounded by a delicate geometric border that complements the triangular shapes in the basket itself. 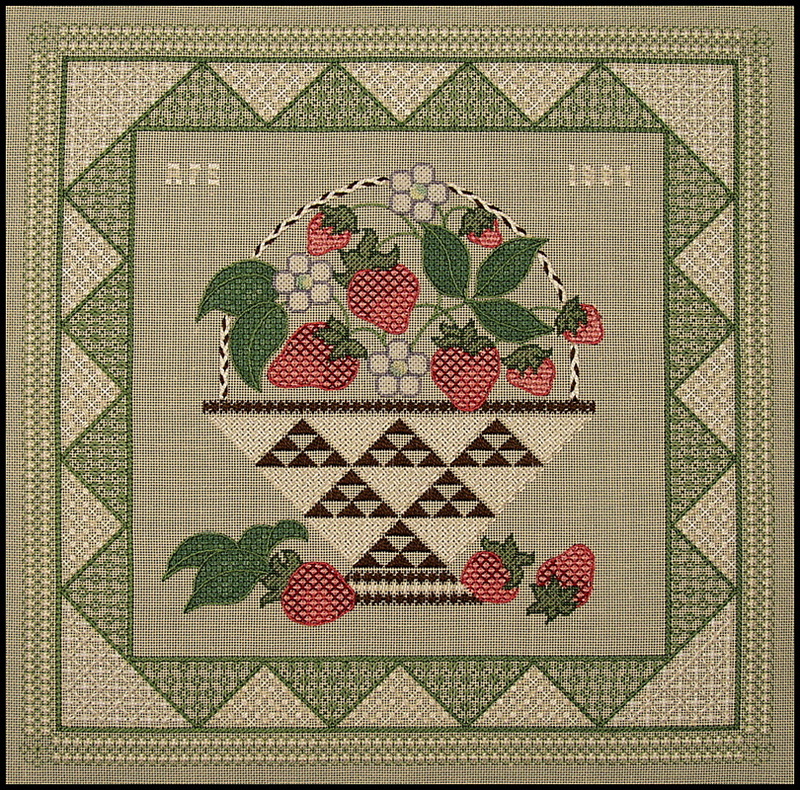 The berries and leaves are freely drawn but the basket and border are counted and must be placed accurately, so some guidelines for combining such free form elements with counted areas will be discussed in class. Most of the fillings in this design are what I call "unconventional" or open diapers so some class time will be spent discussing this unique style of historical ornament and its specific applications in canvas embroidery. Ann is the acknowledged authority on these patterns for the EGA Master Craftsman Program and has written a detailed research paper on this subject. The open treatments used include couching patterns, reversible blackwork, and simulated darning along with open canvas networks, so an additional part of the class experience will be discussions of methods to both design open composite patterns as well as create appropriate sequences that either eliminate or minimize the visibility of traveling threads in the open areas. Before any stitching is done, the berries and leaves will be painted with Chartpak permanent marking pens. The open overlays will be applied on top of the colored backgrounds to achieve subtle shading. In addition, a special formula will be used to create the strawberry blossoms to give them uniformity but some individuality as well. The basket handle is a braid that is woven and then applied to the canvas and couched securely from underneath - a unique applique' effect that adds real dimension to the design. COLOR CHOICE: None for the greens and pinks in the design, but a choice of two different browns or a colonial blue is offered for the basket color. 1. To introduce one method of underpainting open patterns to achieve a subtle shaded effect. 2. To share ways to successfully combine freely drawn elements with counted segments in the same design. 3. To introduce ideas for combining counted thread techniques with canvas and couching treatments to form interesting composite patterns. 4. To teach the fundamentals of blackwork embroidery and to share some tips for keeping the patterns uniform. 5. To introduce a unique shading technique using a specific couching pattern. This technique is used in the strawberries and can be adapted to any bold motif, but it is particularly effective in monochromatic color combinations. 6. To introduce interesting ways to achieve dimensional highlights on a canvas, focusing specifically on the basket handle, but other examples will be shown in class of couched ribbons, ultrasuede applique's, beading and shisha mirrors. TEACHER PROVIDES: Complete kit that includes the drawn canvas mounted on a stretcher frame, a color photograph, a detailed instruction booklet, and all threads and materials needed to execute the design. STUDENT PROVIDES: 2 HiLiter pens, a laying tool, embroidery scissors, clamp or weight to secure frame to the working table, lamp and/or magnifier, if needed, along with an extension cord.